PEACE:"I am fearful when I see people substituting fear for reason." 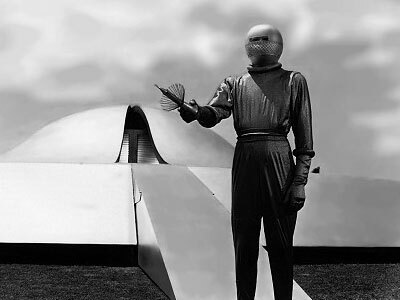 In the 1951 movie, 'The Day the Earth Stood Still', the alien Klaatu comes to our planet with an important message. Ironically, he cannot deliver his vital warning because we assume the worst of new or uncertain things. Klaatu is arrested, confined, and eventually shot, all driven by our fear and suspicion of his motives. Although this movie is over 55 years old, it contains truths that would be valuable for us to consider today. Then and now, the conventional wisdom is to fight aggression with retributive violence. The argument is that a failure to be tough will result in the loss of liberty, resources, or even life. There is ample historic and present-day evidence to illustrate the truth of this perspective. The unfortunate corollary to this perspective is that it exists on both sides of the battlefield. Therefore both sides must be tough, both sides must employ violence, and both sides cannot stop until one or the other is completely eliminated. You cannot just wade in the pool of violence, you must get all in. The War on Terrorism inevitably increases the number of people seeking revenge on America. As more people die from our retribution, more of their children or family members seek retribution themselves. It cannot stop unless reasonable people from both sides make it stop. These are not reasonable times. As Klaatu suggests, "I am fearful when I see people substituting fear for reason." In the movie, Klaatu heals himself and leaves our planet. As he enters his spaceship, he tells us why he came to Earth. It seems all the other planets in the galaxy had created a race of robots programmed to automatically destroy all aggressive warlike behavior. Thanks to this unilateral agreement, all planets live without weapons or armies, knowing that any aggressor will be destroyed. Klaatu offered a simple warning, "Join us and live in peace, or pursue your present course and face obliteration." It would have been a good message for the planet to hear - even today. There must be people on our planet who can rise above their anger to think about the lives of the people still living. I will be hopeful when I see people substituting compassion for fear.